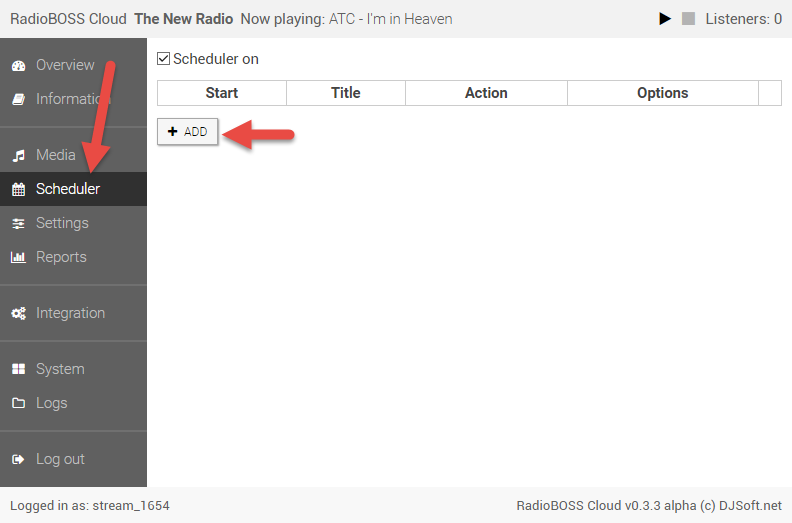 RadioBOSS Cloud lets you schedule tracks, playlists, network streams and other items for playback at predefined times. Scheduled tracks are marked with a clock icon in the playlist window and are removed automatically after playback, except for events, with “Insert as regular playlist tracks” option enabled (see “Event parameters” below for more information). To open the scheduler, click the “Scheduler” menu item on the left. Click the “Add” button to add a scheduled event. The event window will open. Use the “Select” button to set an event action – it can be a playlist, a track or other actions. Set the event start time and other parameters according to your needs and click “OK“to add an event to the list. Action A playlist, music track, or URL that will be launched. File name templates are also supported. Title Any string that helps you to identify the event in the list, can be left blank. The title can also be used as broadcasting title while scheduled event is playing (when Use event title as broadcasting title is active). Start time Event start time. Week days Specify the days of week for launching an event. This option lets you make a schedule for the whole week. If disabled\, the event will launch every day. Weeks Sets the number of the week of the month when the event should launch. For example, if “2nd” and “Last” are activated and Sunday is set under Week days, the event will launch on the second and last Sundays of the month. If disabled, the event will launch every week. Repeat Repeat every [X] minutes no more than [Y] times: The task will be launched the specified number of times at equal time intervals. For example, if the option is set to repeat every 15 minutes no more than 10 times, the task will be executed once at the scheduled time (e.g. at 01:05), and then 9 times at 15-minute intervals (at 01:20, 01:35, 01:50, etc.). A warning icon will appear if repeats exceed 24 hours (that can then lead to unwanted event launches). 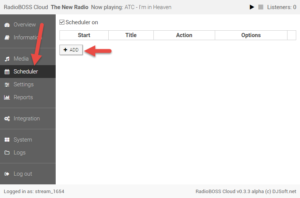 Controls how scheduled tracks are inserted to the playlist window. Enabled event To temporarily disable the event, uncheck this box. Run without waiting for current track to finish If this option is turned on, the event will be played at the time specified. Otherwise, it will be queued and played after the current track is finished. 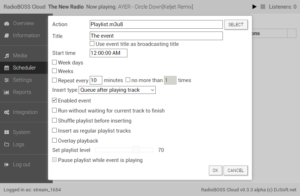 Insert as regular playlist tracks Usually, scheduled tracks are automatically removed from the playlist after playback. Checking this option will prevent this from happening, so the tracks will be kept in the playlist after playback. The queuing options (see Insert type) won’t consider those tracks as scheduler tracks. 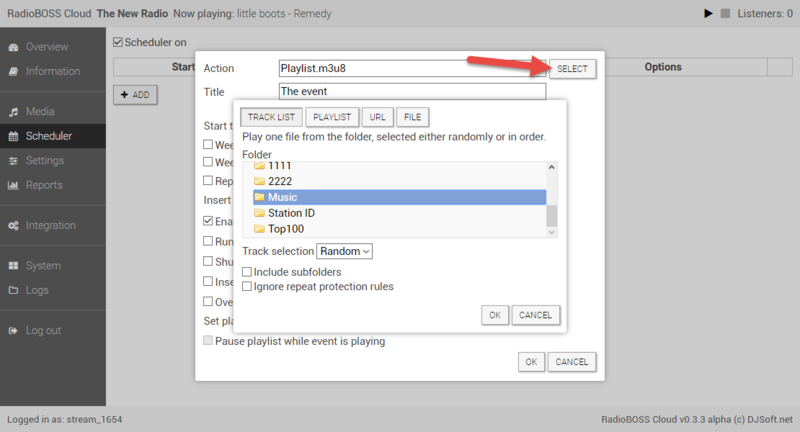 In most cases, this option should be enabled for all events that start music playlists. 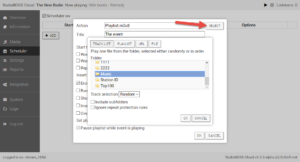 Shuffle the playlist before inserting If the event action is a playlist, the playlist will be shuffled before inserting. Overlay playback If this option is turned on, the track will be played within its own player, along with the playlist. You can decrease the volume of the playlist music using the Set playlist level slider. Use the Pause the playlist while event is playing to pause the playlist while overlay event is being played. The playlist will be automatically unpaused when playback is finished.